As we learned through our client, thousands in her industry are using templates that just look so bland and don’t have personality. Although the content is good, the design is really lacking. We stopped by her office location to take a few photographs of her office and touched up a bit of the building to go well with her logo design and capture the personality and comfort of both the website and the client. We really enjoyed this set of projects and look forward to watching her counseling business grow! Erin Booher Counseling assists individuals of all age ranges and backgrounds. The initial request asked to have the color red and not the color orange. Easy enough, right? One of the challenges with this logo design was that our client also wanted a design that wasn’t too feminine as not to shy away male clients but that also had a little touch of her personality and love of butterflies and florals. With that request, we dedicated 3 logo designers and met several times to brainstorm the best approach to create her first set of 5 logos to choose from. 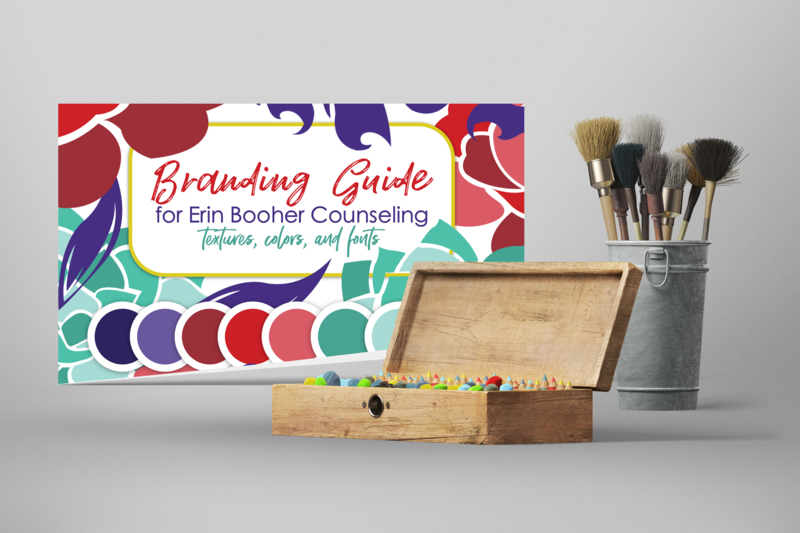 As we went through the next few design stages, we finally arrived at a logo that had a pop of red and that cleverly has Erin Booher’s initials as the wings of the butterfly. 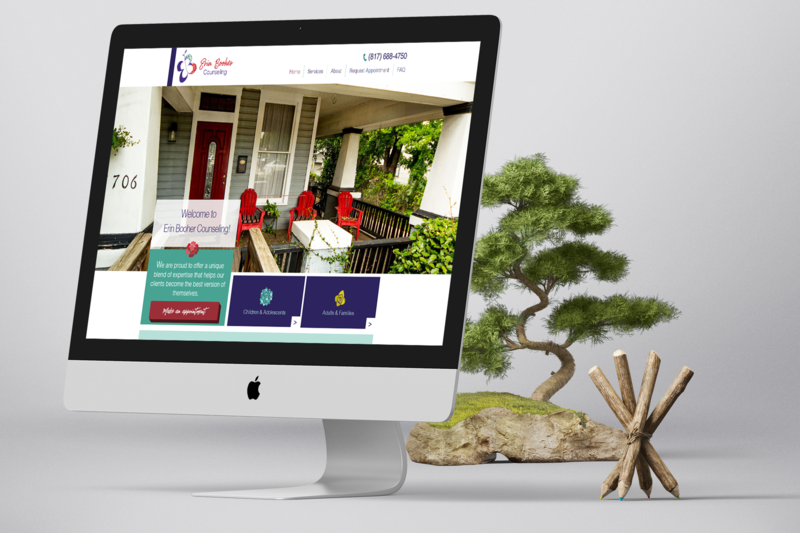 Using a combination of succlents and deep colors, we were able to achieve the look that our client was going for and she was thrilled to see her new brand start to come to live! Erin’s old business cards were now completely at odds with her new branding and a new set of cards needed to be designed. 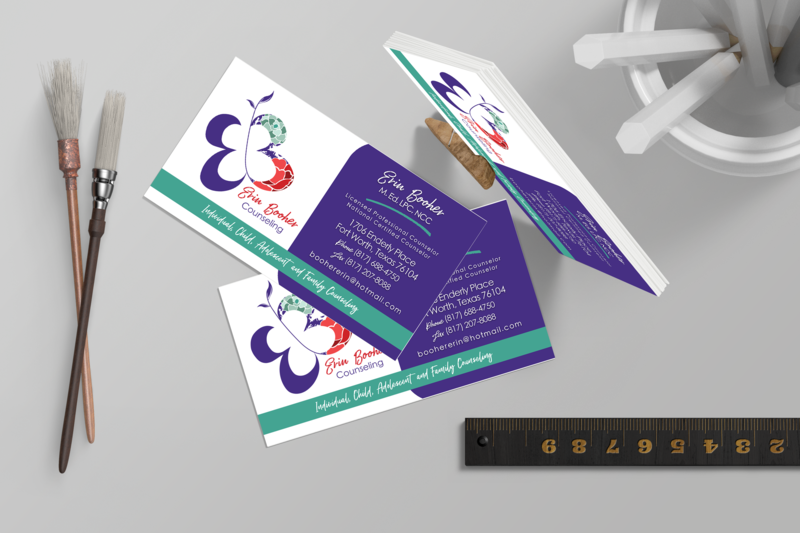 With only a couple of days to turnaround the design to get cards to her in time before she ran out of her own business cards, we were able to put together a business card that functioned as a card as well as an appointment reminder. Erin’s cards were created to appeal to all ages and we worked carefully to make sure that we made all of the text legible and that the detail of her logo was able to shine. One of the challenges with quick turnaround times is that we don’t use standard templates like other design companies – we design each one by hand to make sure that each card is unique for each client. Despite the time crunch, we were able to get her card designs to her on time so that she could hand them out like candy at her next seminar!